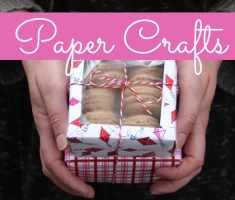 By Sewing Contributor Jessica, from the blog “Life Sew Good”. I’m so excited about this!!! Whoohoooooooooooooooo! I’m a girlie-girl. An athletic girlie-girl, but nonetheless. 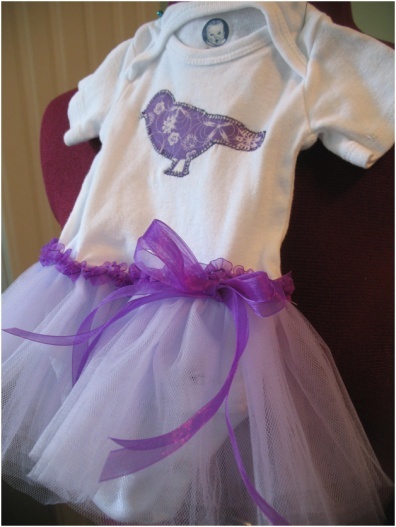 After my 2nd daughter was born, some friends brought over a little onesie that had a tutu attached. Hello!! Super cute. At that point, I didn’t consider trying to make it myself, but over the past 6 months, I’ve been thinking about it a lot. I have a really good friend having her first girl (after two adorable boys) and I felt that this was my perfect opportunity to give it a go. Here’s my disclaimer: there may be a better way. This was my first attempt, but since it worked, I’m ready to share! 1. Cut out your tulle. I used the full width by 4″. I decided on 5 layers, but you can do more or less. 3. Gather the threads of the skirt. 4. 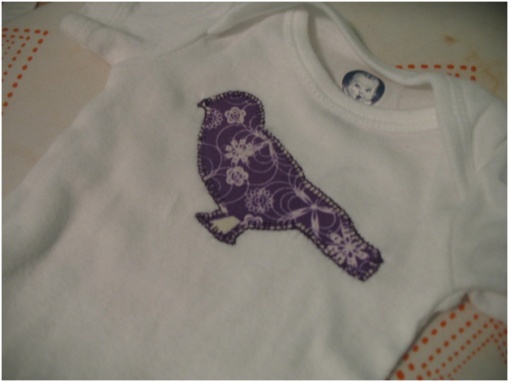 Measure the width of the waist on the onesie. 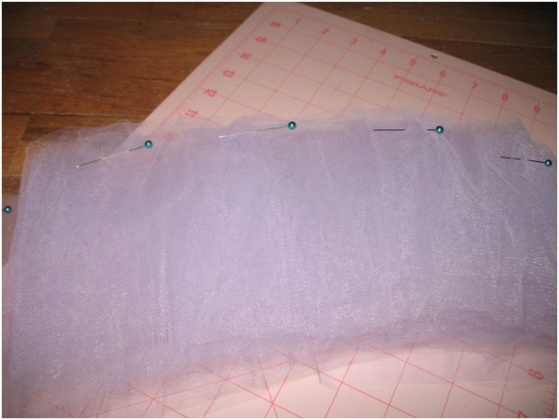 Using this measurement cut a piece of ¼” elastic the same length plus a little extra for seam allowance. 5. 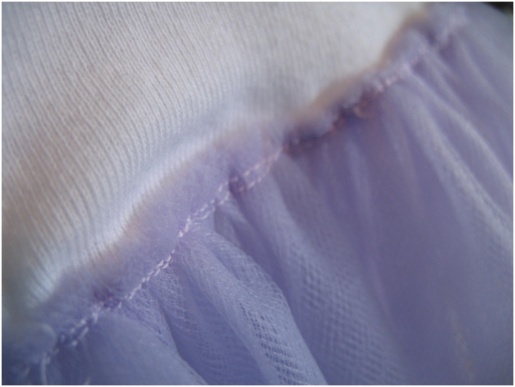 Now, we want to pin the gathered tulle onto the elastic, but we want to be sure the tulle will “stretch” when the elastic stretches. 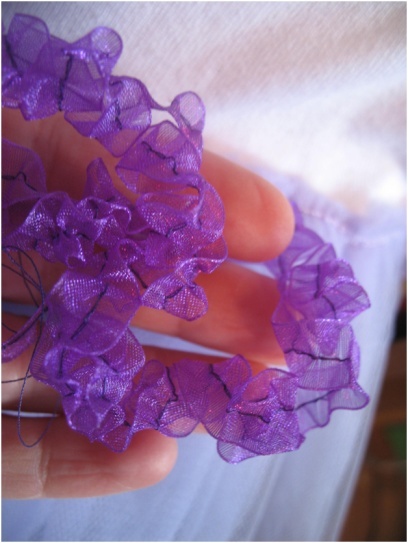 To do this, make your gathered tulle the same length as your elastic while you stretch it out a bit. 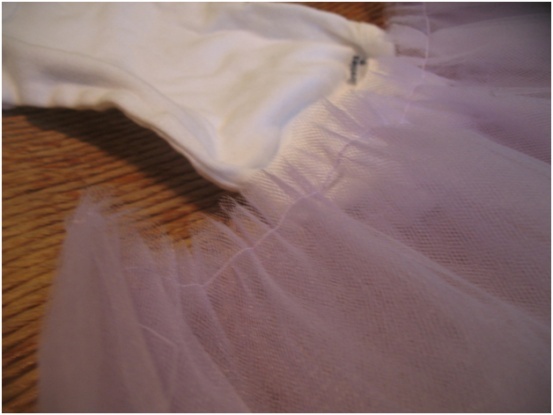 Pin the tulle to the elastic. When you sew, you will need to stretch the elastic as you sew. 6. 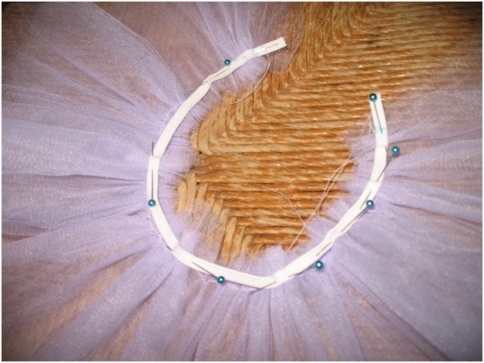 After sewing the tulle and elastic together, overlap your elastic ends and sew together. You now have a little tutu. Set aside and apply your appliqué. 7. 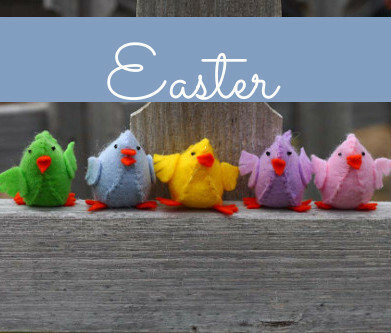 Time to sew your tutu on! Find the middle of your onesie. Keep in mind that you don’t want it too low because diapers are a little bulky, so you may need to aim a little higher than you think. 9. Yup, it looks kind of ugly. But not too worry! Let’s cover it up. Take your ribbon and use another basting stitch right up the center. It will probably gather fairly easily on its own. 10. 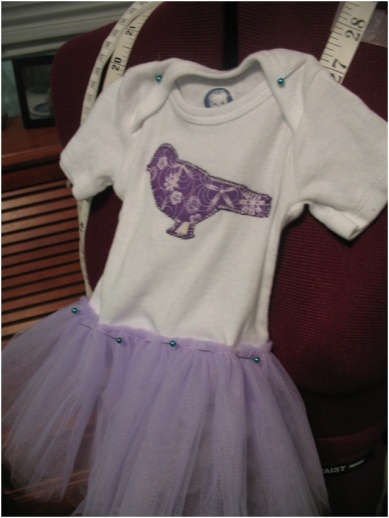 Pin to the top of the tutu and sew on. 11. If you want, make a bow and sew it to the skirt. 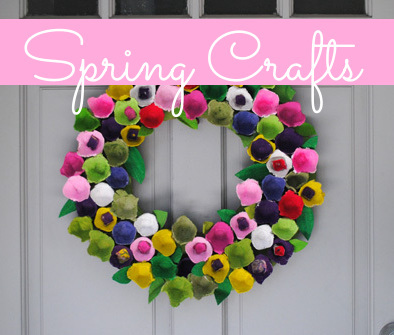 This entry was posted in Crafts, DIY gift ideas, Halloween, Kid's Crafts, Sewing and tagged DIY Clothing, DIY gift ideas on April 18, 2011 by jessica. 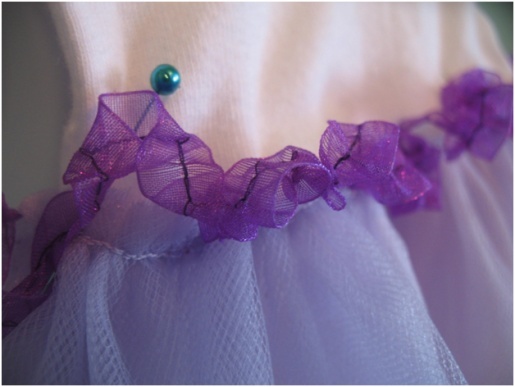 I’m following your fabulous tutorial and I’m to the part of sewing ribbon over the skirt. 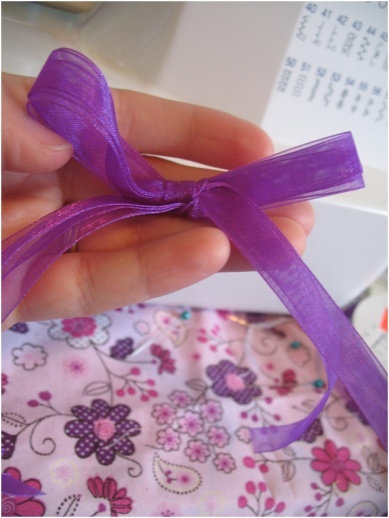 Did you machine stitch the ribbon? Bc wouldn’t that make it lose it’s twirly-ness? Very cute thank you!! I will tweet this over for my followers. I think they are going to get pleasure from it.